Psychoanalytic Reflections on The Freudian Death Drive is a highly accessible book that investigates the relevance, complexity and originality of a hugely controversial Freudian concept which, the author argues, continues to exert enormous influence on modernity and plays an often-imperceptible role in the violence and so-called "sad passions" of contemporary society. With examples from cinema, literature and the consulting room, the book’s four chapters – theory, the clinic, art and contemporaneity – investigate every angle, usually little explored, of the death drive: its "positive" functions, such as its contribution to subjectification; its ambiguous relationship with sublimation; the clues it provides about transgenerational matters; and its effects on the feminine. This is not a book about aggression, a type of extroflection of the death drive made visible, studied and striking; rather, it is about the derivatives of the pulsion that changes in the clinic, in life, in society, in artistic forms. With bold and innovative concepts and by making connections to film and books, Rossella Valdrè unequivocally argues that the contemporary clinic is aclinic of the death drive. 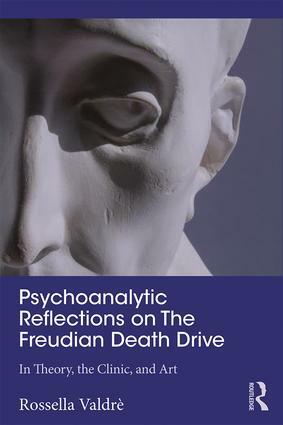 Psychoanalytic Reflections on The Freudian Death Drive seeks to relaunch the debate on a controversial and neglected concept and will appeal to psychoanalysts and psychoanalytic psychotherapists. Today’s renewed interest in the Freudian death drive attests to its extraordinary ability to explain both "new" pathologies and socio-economic phenomena. Is it really the Age of Sad Passions?